As more and more light is being shed upon the molecular landscape of cancer, the architecture for both genetic and epigenetic changes is being exposed. Epigenomic changes are associated with modifications in gene expression at a post-transcriptional level without any alterations to the genetic code itself. In this genome-wide epigenetic study, published in BMC Medicine, we provide a comprehensive overview of the disrupted methylation patterns that occur during the development and progression of cutaneous melanoma. Methylation can switch genes on or off, influencing the transformation and aggressiveness of tumour cells with exactly the same DNA sequence. Methylation is a natural process that predominantly takes place on one of the four “letters” or bases that constitute DNA. Modifications by a chemical methyl group often target the DNA base cytosine. This process is termed methylation. This alteration can switch genes on or off, influencing the transformation and aggressiveness of tumour cells with exactly the same DNA sequence. 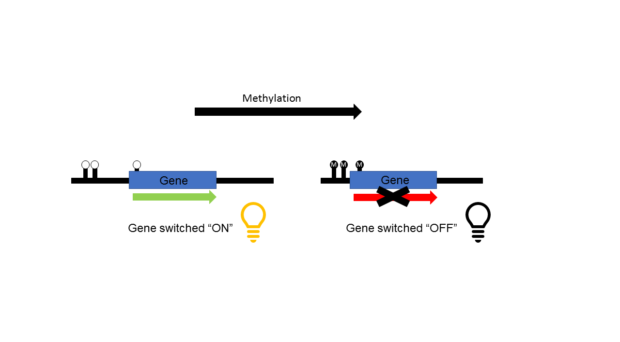 Mapping of these “on-off switches” and their associated methylation patterns can hold prognostic power towards stratifying patients who have benign versus more aggressive tumour types. Our research compares methylation profiles that are altered during the development and progression of cutaneous melanoma. The evolution of malignant melanoma starts from benign nevi into primary melanomas, and finally aggressive metastasis, which results in the development of secondary malignant tumours away from the initial primary site of the cancer and malicious spreading throughout the body. We were able to identify a DNA methylation signature associated with patient survival. Specifically, we mapped the global methylation profiles across these three distinctive phases. This allows us to take a closer look into the multi-step transformation process of these three distinctive stages and demonstrate the importance of gene methylation during tumour initiation, aggressiveness, and metastasis. To pinpoint functional implications of these differentially methylated genes on gene expression, we cross examined and matched publicly available gene expression data sets together with their associated site-specific samples and progressive stages. This interrogation displayed reflective expression patterns between differentially expressed genes and their associated methylation patterns, again exhibiting overlap and significance between gene expression and their methylation status. When functionally classifying these differentially methylated genes, certain central melanoma and metastasis-related pathways involving cell/tissue polarity and cell-cell adhesion were identified. Recent advances looking at gene expression signatures have resulted in the development of assays that predict patient outcome being introduced onto the market. These novel tests are increasingly being used in various cancer types to assist clinicians in choosing the best possible treatment options. Similarly, albeit at an epigenomic level, we were able to identify a DNA methylation signature associated with patient survival, i.e. of prognostic relevance. Finally, we examined expression of several of the differentially methylated genes at the protein level via immunohistochemistry. This provided prognostic information on an independent melanoma patient cohort, thus, offering additional opportunities towards clinical utility. These results reflect the importance of epigenome regulation by means of differential methylation patterns (“on-off switches”) in assisting the transformation process from benign nevi to primary tumour lesions to metastatic spreading. Important cancer-related pathways are addressed to contribute in the shift from a harmless benign status into a more aggressive phenotype. The ability to track these shifts through DNA methylation-based biomarkers offer opportunities to improve and contribute to stratification capacities of traditional histopathological parameters such as tumour thickness, mitotic index, or ulceration. Can genetic variations predict response to Copaxone in multiple sclerosis patients? Dr. Peter Dynoodt completed his PhD work within the Dermatology Research Unit at the University of Ghent, Belgium. Afterwards, he joined the SYS-MEL Consortium on a Marie-Curie Fellowship at OncoMark in Dublin, aiming to develop next generation prognostic/predictive biomarker assays for the clinical management of melanoma. Currently, he is a Product Development Scientist in OncoMark focusing on the development of a novel prognostic assay containing a multi-biomarker panel of Master Transcription Regulators (MTRs) involved during early stage breast cancer. Dr. Jasper Wouters is a postdoctoral scientist at VIB-KU Leuven Center for Brain & Disease Research with a particular interest in the epigenomic plasticity in cancer (ORCID 0000-0002-7129-2990). He studied Bio-engineering in Cellular & Genetic Biotechnology at the University of Leuven (Belgium), where he graduated with a Masters in 2008. After his PhD in Medical Sciences, studying the potential involvement of cancer stem cells in melanoma, he joined the SYS-MEL Consortium on a Marie-Curie Fellowship at OncoMark/UCD in Dublin. Currently he is a postdoc in the lab of Stein Aerts at VIB, funded by a fellowship from Kom op Tegen Kanker.